Philadelphia Eagles quarterback Nick Foles celebrates after throwing a touchdown pass in the third quarter against the Minnesota Vikings in the NFC Championship Game. It wasn't supposed to happen this season. Not when the year started. Not when Carson Wentz was lost for the season. It just wasn't ... right up until it did. The Philadelphia Eagles are headed to the Super Bowl after beating the Minnesota Vikings, 38-7, in the NFC Championship Game. And, thirteen years after their last conference title, they'll get a shot at revenge against the New England Patriots, who advanced to Super Bowl LII with a comeback win over the Jaguars earlier on Sunday. The Eagles dominated the Vikings on both sides of the ball. And while many expected the defense to do its job – it more than did that on Sunday with three timely turnovers, including a pick-six by Patrick Robinson that turned the tide of the entire game – but the real story at Lincoln Financial Field was the play of quarterback Nick Foles ... and the play-calling of second-year head coach Doug Pederson. Against the Falcons in the divisional round, Pederson called arguably his best game of the season. On Sunday, he was even better. And perhaps no single call was better than his decision to dial up a flea-flicker on the Birds' first possession of the second half, a back-breaking 41-yard touchdown to Torrey Smith that put the home team up, 31-7, and the game out of reach. But no matter how great of game Pederson called, he still needed Foles and the rest of his offense to execute. And execute, they did. The 38 points scored by the Eagles was the most the Vikings had allowed all season. After a rough first series that saw a pair of mental mistakes force them into a punt, it was all Eagles. The defense responded with that aforementioned pick-six, and that's when Foles took over. 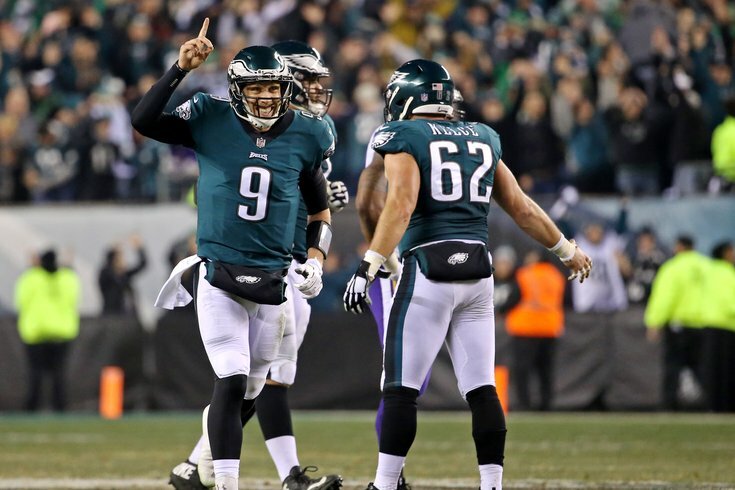 Foles finished the game 26-of-33 for 352, three touchdowns and no interceptions (141.4 passer rating) and seemed to get better as the game went on. In the second half, Foles completed all 11 of his passes, including two for touchdowns. This wasn't the Foles we saw in St. Louis. This wasn't the Foles we saw the last few weeks of the regular season. This wasn't even the Foles we saw last week in the Eagles' win over Atlanta. No, this was 27-touchdown-two-interception Nick Foles. And it came against the top-ranked defense in the NFL. Most impressive, perhaps, was what Foles was able to do on third down, especially when you consider Minnesota was one of the best teams in NFL history in third-down efficiency. In the regular season, the Vikings held opponents to just a 25.2 percent success rate on third down. The Eagles finished 10-of-14 on third down, including 8-of-10 through the first three quarters, when the outcome was still somewhat in doubt. At times, it was easy to forget this was Foles, and not Wentz. Especially on third down. Nick Foles making a little magic happen. Now, after beating the same two teams the beat in their last Super Bowl run (the Falcons and the Vikings), they'll face another familiar foe in the Patriots. And they'll be doing it from a familiar role, one they've thrived in this postseason.
.@CaesarsPalace opens Patriots as 6-point favorites over the Eagles in Super Bowl LII. Total opens at 46.5. And these dogs might not be full just yet.